All our Sofas, Chairs and Footstools are handmade in Nottingham at our workroom by us at Vale Upholstery to the highest quality, from modern to traditional we are positive there’s a style for you. Select from Foam, Fibre or even Feather cushions - right down to the smaller details, even the shape, size and colour of your legs resulting in a truly bespoke piece of furniture. Furniture that offers timeless elegance to any interior. 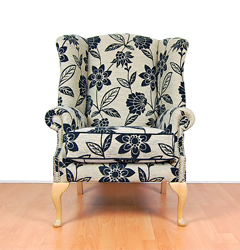 Beautifully Upholstered in Fabric or Leather, finished with eye catching trim and accessories. Handmade legs - in a vast range of shapes, sizes and colours available with solid brass castors. Beautiful hand studding for a true bespoke piece of furniture available in five colours. We offer a vast range of upholstery fabrics, from renowned design houses such as Sanderson and Designer Guild. In a fine selection of innovative textures and delicious colours, with the up most quality and style to satisfy the most demanding of tastes. Every piece of Bespoke Furniture is hand-made in Nottingham exclusively by Vale Upholstery. Hardwood Frames - Glued, Screwed and Dowelled that are built to last.